Water is vital to physical health, and if you are trying to lose weight or maintain good health, it is crucial. Without adequate intake, you cannot metabolize fat or eliminate waste and toxins that make you ill. The human body might feel solid, but it contains a surprisingly high concentration of water. An adult human being's body is made up of about 60 to 70 percent water; infants and children are made up of about 75 percent water. The brain is about 85 percent water. Muscles are about 72 percent water. Fat is about 15 percent water. Because their bodies contain more muscle mass, men have more water in their bodies than women. For everyone, it performs various functions in the body: it carries nutrients through the system, lubricates joints, transports waste, and keeps the skin supple. If the kidneys don't get enough fluid, the liver stops metabolizing fat and starts filtering waste. If the intestines do not get enough, they pull what they need from the cells in the bowel, causing constipation. Dehydration affects the high-water-content parts of the body first, so the initial symptoms of dehydration are weakness (fatigue) and decreasing mental alertness. Other symptoms include dizziness, headaches, thirst, and vision disturbances. The skin loses its elasticity and becomes dry. The joints lose their fluid cushions and begin to ache. Continuing in a dehydrated state will cause the body to begin to shut down. According to the National Library of Medicine, the symptoms of dehydration include thirst, dry mouth, a sticky feeling in the mouth, and low or no urine output. In cases of severe dehydration, you may become dizzy, faint, or even lapse into a coma. Most dieters aren't dehydrated to the point of noticing major symptoms. However, if you fail to drink enough fluids during the day you may become increasingly thirsty and feel that 'dry as a desert' feeling in your mouth, which means you need to reach for a glass of zero calorie water. All people should consume a minimum of 64 ounces a day, and many people drink as much as two gallons daily with no ill effects. A person who is overweight should drink an additional 8 ounces for every 25 pounds over his ideal weight. (Dr. Ellington Darden has a weight-loss protocol that includes "Superhydration;" his patients drink at least a gallon of ice-cold water daily, and they claim they feel better and look better than they ever did before.) Intake should be spread over the course of a day. Drinking too much of any liquid at one time will make a person very ill. While other liquids provide hydration, water is the best option for anyone trying to lose weight. Water has zero calories and provides optimal hydration. Other liquids such as diet colas and diet soft drinks may be calorie-free but often contain caffeine, which acts as a mild diuretic. A diuretic helps the body release water, which actually increases your need for more water. Diet drinks may also contain aspartame and other artificial sweeteners; some artificial sweeteners cause unpleasant side effects if consumed in excess. 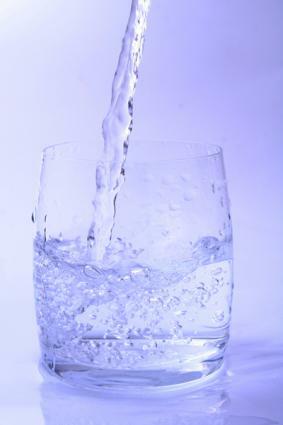 Other liquids provide hydration, but water remains the single best drink for dieters. Although it is true most experts recommend 64 ounces a day, there is no need to panic if you haven't been downing eight glasses a day. Many foods and beverages contribute to your total fluid intake. For example, fruits, such as oranges and watermelon, as well as many vegetables, such as spinach and other leafy vegetables, contain a significant quantity of water. Although it is not the best way to hydrate your body, foods do provide essential nutrients not contained in pure water. If you think your fluid intake is low, a gradual addition of one glass per week may be tolerated well and very beneficial to your overall health. Can Too Much Be Consumed? Drinking too much water may lead to hyponatremia, a life-threatening condition in which the body's sodium and electrolyte balance is profoundly disturbed. Hyponatremia is very rare. It is usually seen in endurance athletes who cannot stop to urinate. To prevent hyponatremia, a person should spread his fluid intake throughout the day and make sure to go to the bathroom frequently. People on medications should consult their doctors before making radical changes in their eating and drinking habits. Water consumption can alter the effectiveness of many medications, and the doctor will want to monitor the patient carefully while his body is becoming accustomed to the change in diet.